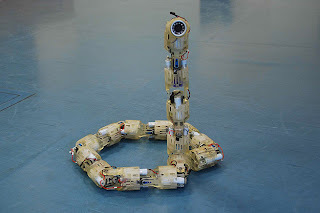 "According to dvice, “each segment of this snakebot is totally self-contained with a brain, sensors, motors and batteries. While the segments are designed to work together… each segment is capable of operating by itself if the snake gets damaged.” Right now, this snakebot is learning how to slither more realistically, after that; he’ll be ready for battle. Wth?"